Indiana 25 exists in two segments along a southwest to northeast path across north central Indiana for a total of distance of 123 miles. The western segment begins at Indiana 32 near Waynetown in Montgomery County and runs north toward the Lafayette area and ending at the intersection of U.S. 52 & 231. 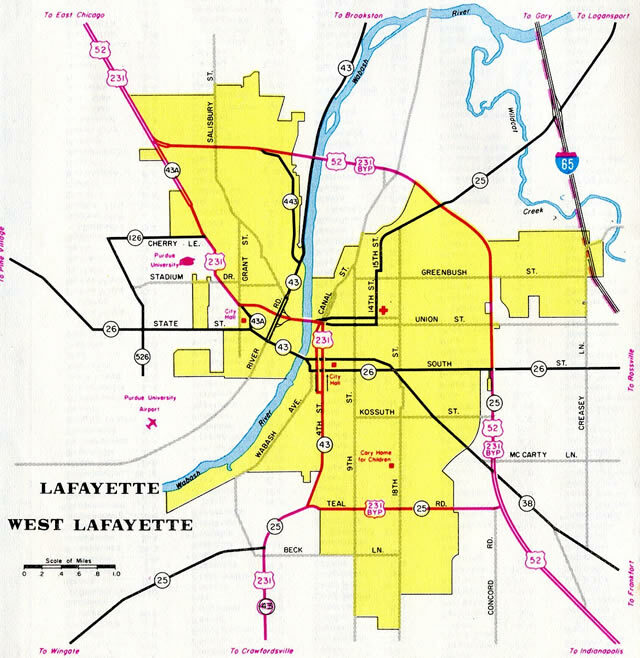 The highway used to follow Teal Road, Sagamore Parkway and Schuyler Avenue around the city of Lafayette before meeting up with the now-eastern segment of the highway at Interstate 65. 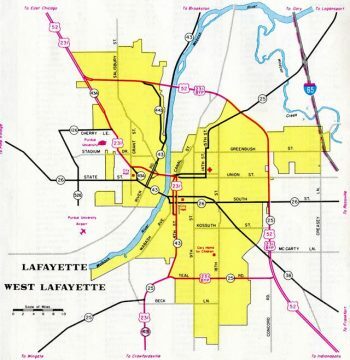 As of September 13, 2013 that is no longer the case as INDOT decommissioned that stretch of highway when U.S. 52 was routed off of Sagamore Parkway and onto Teal Road and all roadways other than U.S. 52 and U.S. 231 were given back to Lafayette. This has created a gap in the highway, that has best typified the INDOTs policy on decommissioning highways without providing an alternative route, for those traveling from northeast to southwest and vice versa. From Lafayette, it heads northeast toward Delphi and Logansport along the Hoosier Heartland Corridor, a new four-lane expressway that carries some characteristics of a freeway with limited at-grade crossings and two new interchanges at Delphi and Logansport. From Logansport, the highway continues north and northeast through Rochester before ending in the Kosciusko County seat of Warsaw. The middle stretch of the highway from Lafayette to Logansport is an important trade corridor, part of a larger corridor between Layette and Fort Wayne, and for these reasons it is (and will) be expanded to four lanes. On October 24, 2012 the segment from Interstate 65 in Lafayette to U.S. 421, Indiana 18 & 39 in Delphi was opened. The remainder segment from Delphi north to U.S. 24 & 35 opened October 18, 2013. Indiana 25 originally traveled through Downtown Lafayette along a combination of surface streets. The route was later relocated to bypass the city along side U.S. 231 Bypass. Prior to the extension of U.S. 231 north into Indiana in 1954, the alignment along Teal Road was Indiana 552. Indiana 25 shields formerly posted at the intersection of Main and Washington Streets in the center of Delphi, the Carroll County seat. Indiana 25 previously followed Main Street town before being rerouted onto the Hoosier Heartland Highway along a bypass to the south and east. U.S. 421, Indiana 18 & 39 still follow Washington Street and Main Street west town. Note the cutout shield for U.S. 421, one of a few posted in Delphi. Photo taken 12/28/11. A view of the Carroll County courthouse in Delphi at the intersection of Washington and Main Streets where IN 25 once combined with U.S. 421 & IN 18-39. Located within a square in the heart of Delphi, the courthouse was built in 1916. Photo taken 12/28/11. Main Street (old Indiana 25) westbound at U.S. 421 & Indiana 18-39 (Washington Street) in Delphi. IN 25 previously combined with U.S. 421 westward for 0.4 miles. Photo taken 05/30/10. Lafayette is the control city for Indiana 25 at the split diamond interchange with U.S. 24 & 35 in Logansport. Photo taken 11/25/15. Another sign at the interchange with U.S. 24 & 35 gives three control cities. Lafayette (via Indiana 25 south), Monticello (via U.S. 24 west) and LaPorte (via U.S. 35 north). Photo taken 11/25/15.